Custom fields are helpful in adding additional classification or specific searchable information to your articles. With custom fields, a user can create variables and add custom values to them. Click "Custom Fields" link in Articles section of left navigation bar to open "Custom Fields" page. In multi-language edition, the language name in which custom field will be created is mentioned with panel heading. 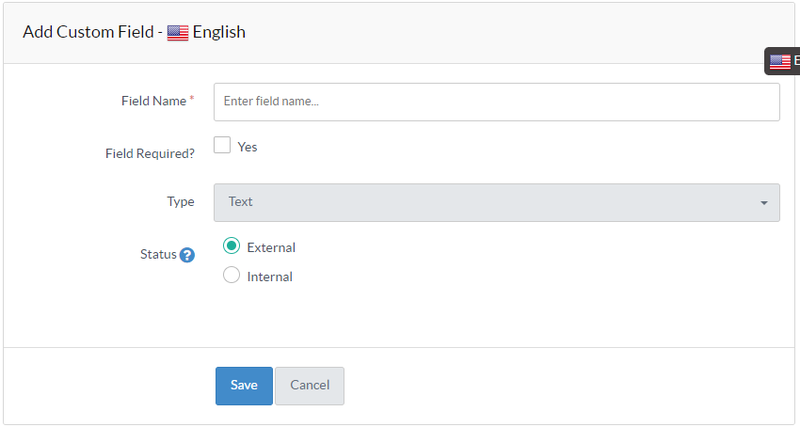 As shown in the screenshot above, the custom field is being added to English language, so, English is written with panel heading "Add Custom Field". You can change the language from language drop-down available on the right side. It is mandatory to enter "Field Name" to identify it. Field Required: Mark this checkbox to set the custom field as a mandatory field on ’Add Article’ page (Refer article: Adding an Article ). Text features a simple, single-line text field into which text can be typed. Drop-down is a form field intended for listing many options in one condensed area of space. Checkbox list is made up of a series of options, each displayed with a checkbox. To select an option, the user can “check” (ticks) the option. Click on "Save" button to save the details of custom fields in the database or you can abort the process by clicking on "Cancel" button.